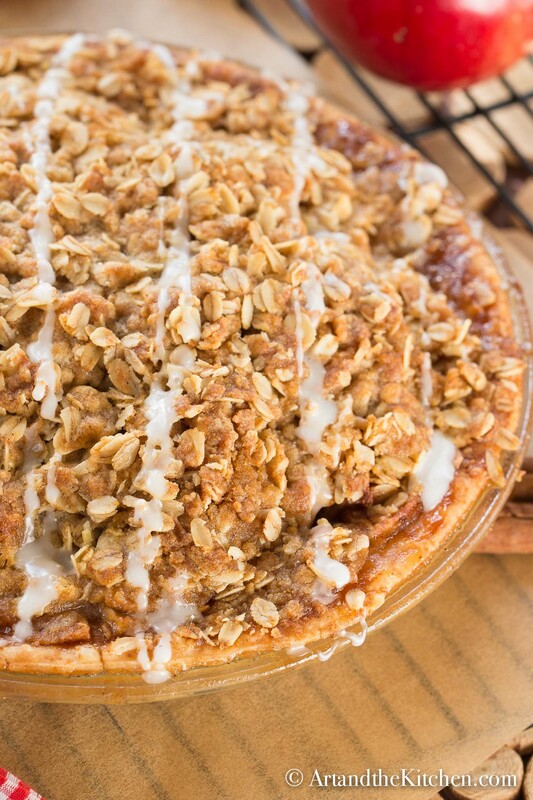 Apple Crisp Pie is a delicious combination of good old fashioned apple pie with a crumbly oatmeal crisp top! 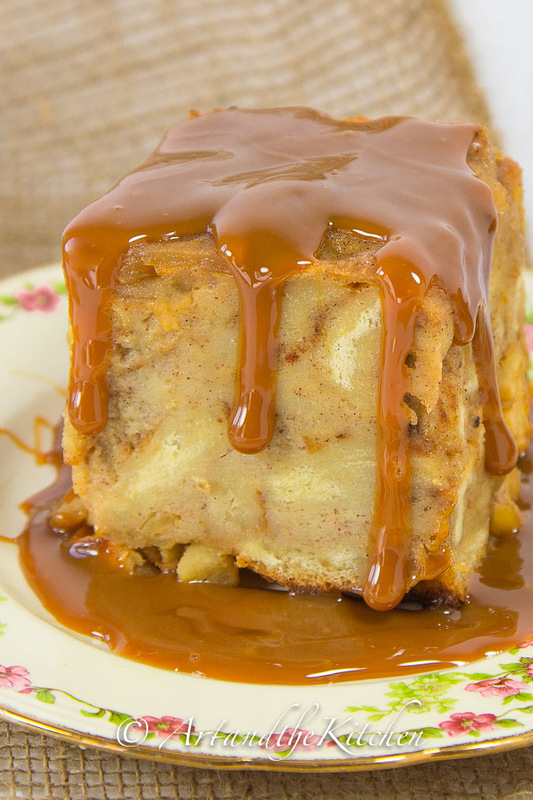 Serve warm with a scoop of ice cream and you have one of the best apple desserts EVER! Hi, I am Garrett, Art and the Kitchen’s (aka Mom) son. My Mom recruited me to give her some help with her blog. 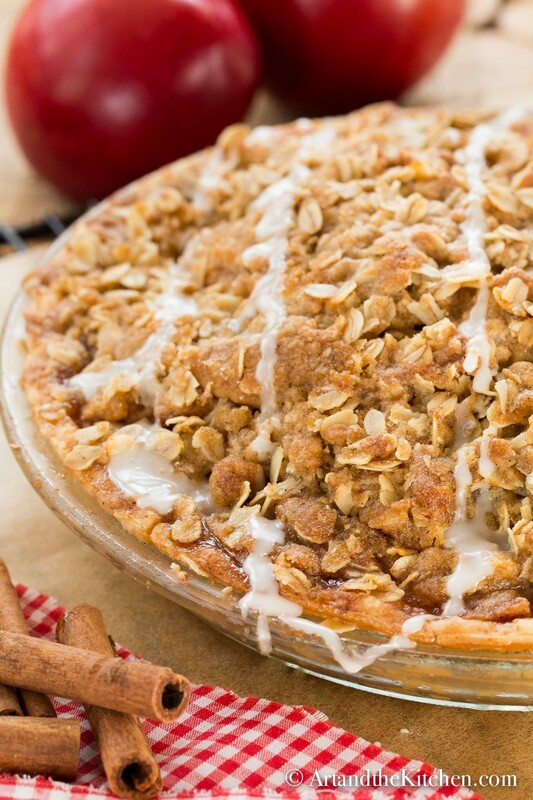 I am starting things off with one of my favourite recipes, Apple Crisp Pie. 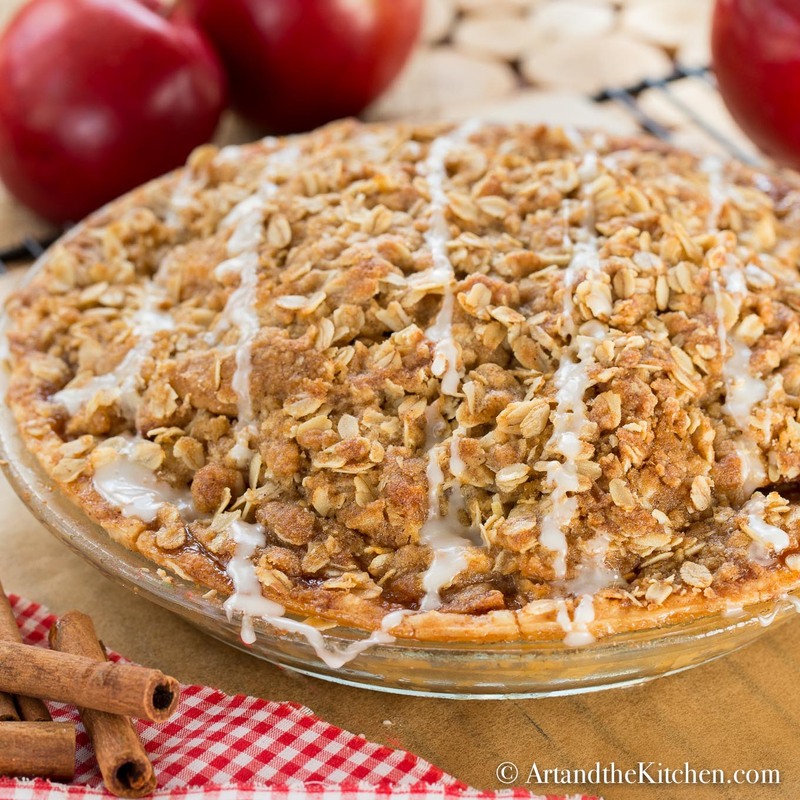 This recipe is incredible with its cinnamon apple filling and golden crispy topping. 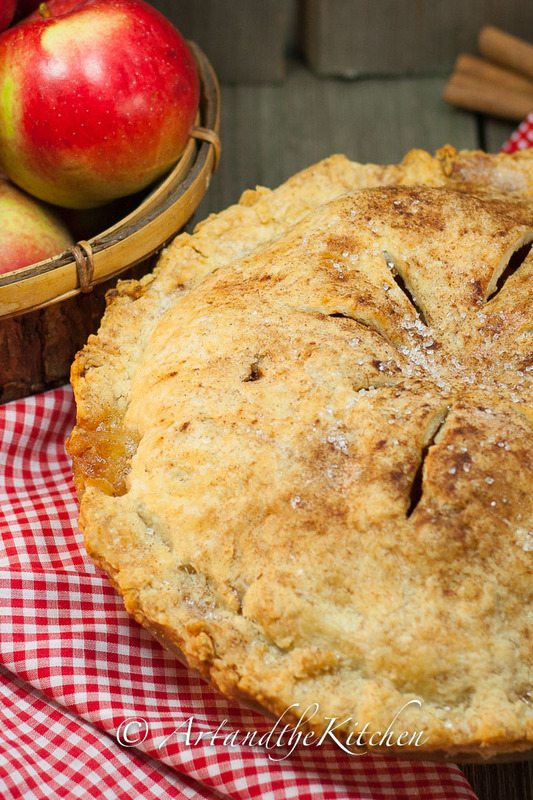 I used a store bought pie crust which made this recipe quite quick to prepare. If you want an exceptional pie crust try the Homemade Pie Crust recipe my Mom makes. In large bowl toss together apples, brown sugar, granulated sugar, cinnamon. Sprinkle with flour to coat apples. Pile into pie crust. To make crisp topping. In separate bowl mix together flour, oatmeal, brown sugar, cinnamon and salt. Cut the butter in using a pastry blender or fork blend until crumbly. Do not over blend. Sprinkle evenly over apples. I layered it on quite thick. Bake approx 1 hr to 1 hr 15 mins in 350º F oven. Well done Garrett! and MOM! Thank you Jenn, we love cooking and baking together. I have never signed up for a newsletter until today. Your blog is inviting and recipes are all shown well and directions are clear. I wish you the best with your business… I also call it shepherd’s pie made with beef. Thank you so very much Hollie, hope you enjoy the recipes. Made the Apple Crisp pie, followed the recipe but unfortunately it didn’t turn out. Too runny, apples did not get done. Cut the first piece and it was like soup with Apple chunks. Disappointed. Hi Lynne, did you toss the apples with the flour? What kind of apples did you use and how thick were they sliced? This. Is. Pure. Genius. Two of the very best apple desserts in one- MUST try! 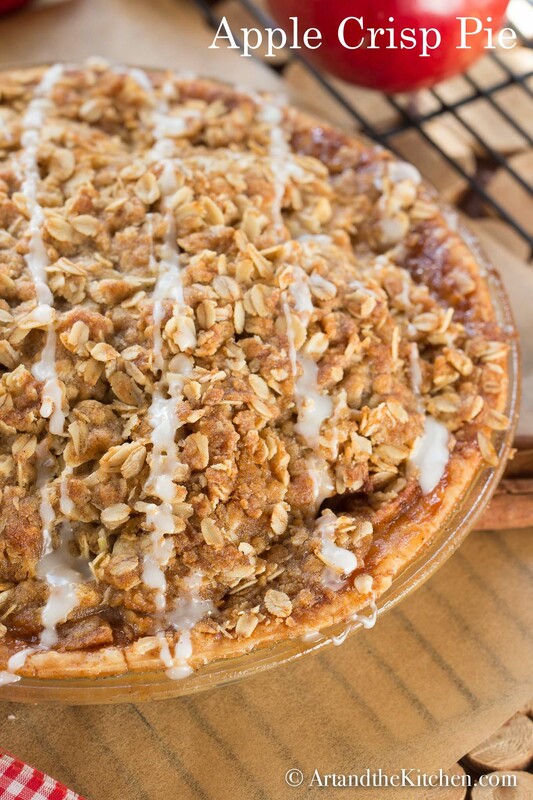 Thank you Karly, I love apple desserts and this recipe is one of my favs! Not a comment just a question. I am using a refrigerated roll out crust. I am only using one crust obviously b/c I am making the crumb topping. Do I prebake the crust or just unroll and use? I am using canned apples just to use them up.